It’s a common misconception that if you want to own a smartwatch, you’ll have to spend at least 200 USD with prices sometimes skyrocketing up to 1,000 dollars! That seems a little insane to us. It seems perfectly reasonable to be able to purchase a smartwatch at a price that won’t bankrupt you. If you do a little bit of digging, you can find plenty of smartwatches at a decent price that is actually high quality and will do anything that a $500 smartwatch will do. If you’re reading this then lucky for you, we’ve done all the hard work so you can find the best smartwatch under 50 USD. We’ve compiled a list of the six best smartwatches under 50 dollars that, more or less, pack in a lot of the same features that you can get with a 300 or 400 dollar smartwatches. Read on to see how you can stay connected, look stylish, and feel tech-savvy – all for under 50 bucks! Let’s get a quick overview first of all the smartwatches on the list with a couple of key features. Then we’ll get to which one is the best smartwatch under 50. Excellent! Now let’s dig into each of the individual product reviews. The one thing that you want to look out for when you purchase your first smartwatch is compatibility. You could get the best deal on the most beautiful smartwatch in the world that folds all of your laundry – but if it’s not compatible with your phone then it’s going to be pointless. A lot of smartwatches are going to be compatible with both Android and Apple but just make sure you double check because there are a handful that are compatible with Android only or have limited capabilities when you use them with iPhones (we’ll make sure to point them out on our list if that’s the case). Just for the record, the Antimi SmartWatch is compatible with just about every type of phone including: Samsung, Google Pixel, Pixel XL, HTC, Sony, LG, HUAWEI, ZTE, OPPO, and all of the iPhones (although some features are limited with the iPhone, more on that later on in the article). Perfect! Now let’s get into the features of the actual watch. It has a pretty sleek design to start off with. One huge thing that we love about this smartwatch, and you’ll see this in a few other designs, is that you can use it in two modes. The first is Bluetooth mode which is how most smartwatches function. This means you simply connect it to your phone via Bluetooth and you’ll receive notifications, calls, etc. that way. 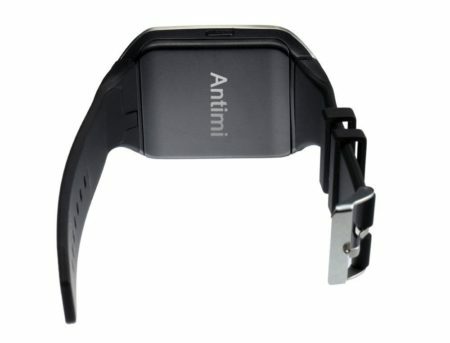 But the Antimi SmartWatch can also be used independently, essentially as a stand-alone phone. Just note however, that you will need an additional micro sim card in order to use this feature. Other than working as a stand alone phone, it has all the typical features you would normally find in a smartwatch. With the sim card, it can run Facebook, Twitter, and WhatsApp independently. In Bluetooth mode, you can receive push notifications from all of those apps. You’re also able to access your phone book, an alarm clock, sleep monitor, and pedometer in Bluetooth mode as well. A couple of other pretty cool features that this watch has as well are remote camera access and a sedentary reminder. This will definitely step up your selfie game, being able to leave your phone somewhere else and take it with your smartwatch. The sedentary reminder is also extremely useful, especially if you work at a job where you’re forced to sit all day. This watch will remind you every hour or two to remind you to get up and move your body! Overall, some decent features are included with this watch for only 30 dollars. One important thing we need to note about this watch is that the compatibility with the iPhone is extremely limited. 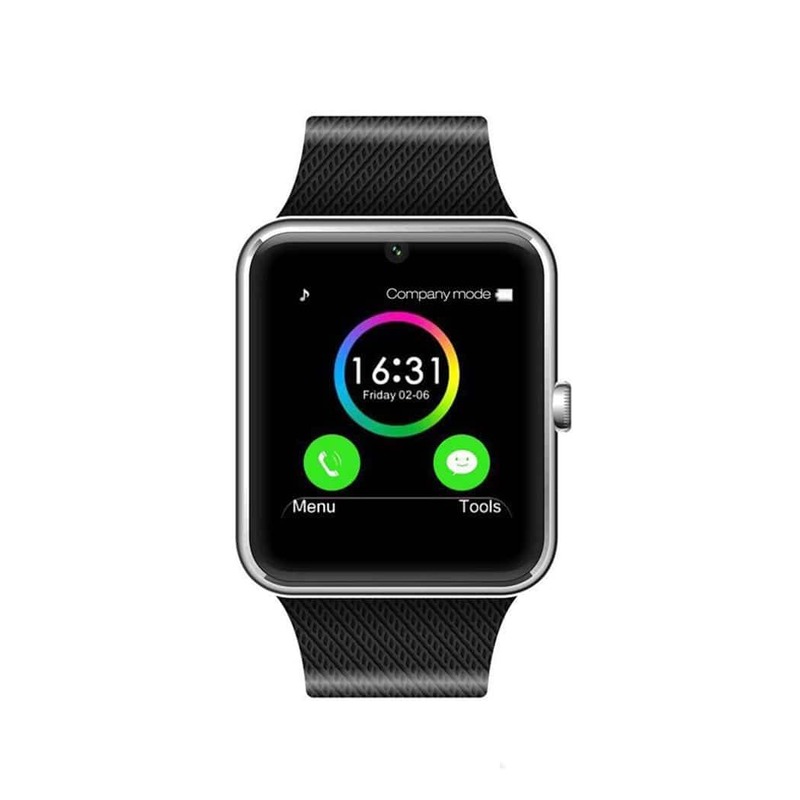 In Bluetooth mode, you can essentially only make/receive calls with the watch. 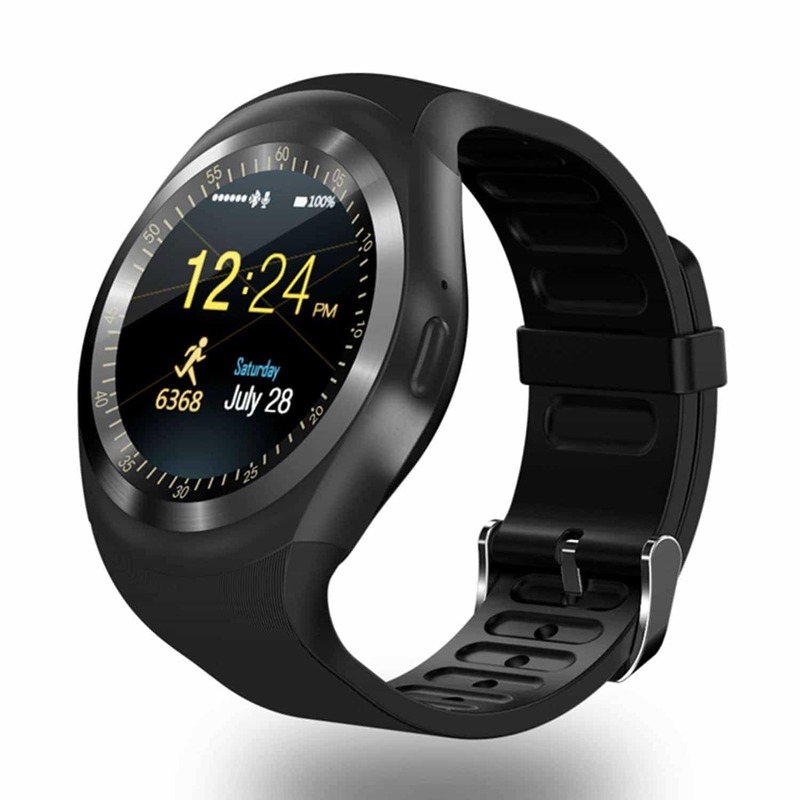 If you do purchase a micro sim card, you’ll be able to run the apps independently but this smartwatch is really optimized a lot more for Android phones. Overall though, a great first contender with all of the key features that we want to see in a smartwatch. We definitely think this is a solid purchase for just 30 bucks so give it a go! We know what you’re thinking – this doesn’t look like your traditional smartwatch and you’re absolutely right! The Martian Watch Notifier Smartwatch is definitely not your typical smartwatch – we think it might be better! From a design aspect, we love that it looks like a classic watch. You could get away with wearing this at work or to a nice dinner and it would look like you have just a normal (nice) watch on. Does that mean with such a small notification are that you’re going to lose out on all the features that typically are found in a smartwatch? 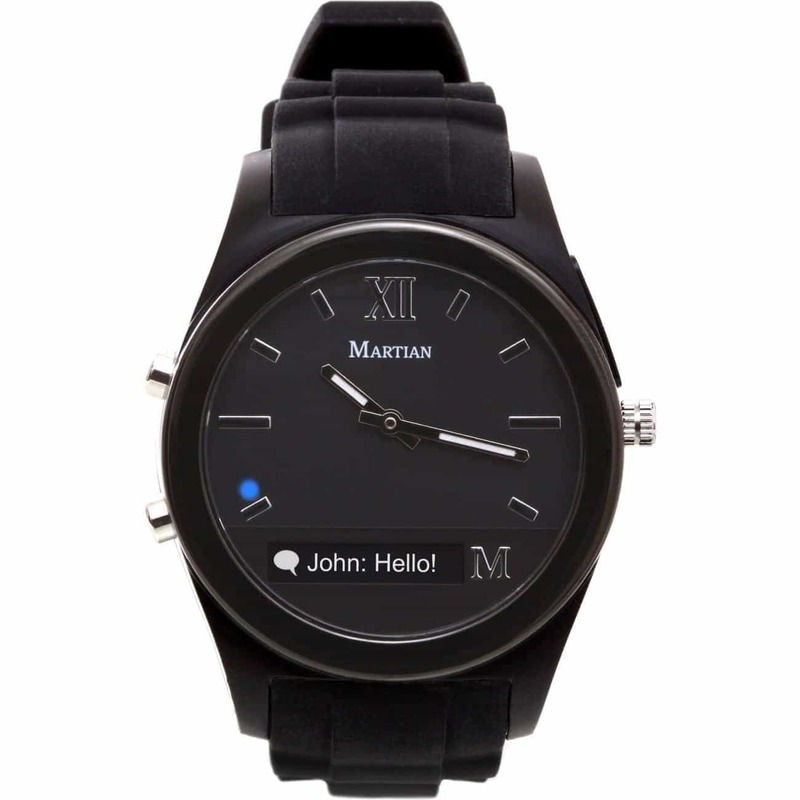 The Martian watch is compatible with just about all Android phones and also iPhones. And unlike with the last watch, you don’t have to compromise any of the features with the iPhone! Just what we like to hear. It has a 1.5” OLED display and the resolution is impeccable. It’s a small area, but the screen is very easy to read and you’ll have no troubles making out exactly what’s on the screen. In fact, you’ll see it in crisp and clear detail. As far as notifications, you can get notifications from hundreds of apps. 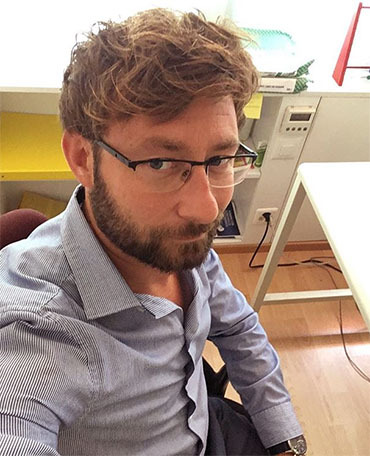 It doesn’t just stop at Facebook, Twitter, and Whatsapp. You’re able to customize the vibration patterns that you get from each of the apps as well, so you’ll only look down when it’s one that you know is important. And if you don’t want alerts from a specific app at all, you’re able to easily filter them so that you only get notifications from the apps that you truly want. Say you get a notification but don’t quite get around to looking down at your watch right away. No problem! Tap the glass face on the watch within five minutes of receiving the notification and it will automatically scroll across your screen again. In addition to all the customizable notification settings, the Martian Smartwatch also gives you remote camera control – a feature we didn’t think would be included at first glance. How many times have you been at a restaurant and after a nice long meal, you mindlessly get up and start to head home before realizing 20 minutes later that you forgot your phone at the restaurant? That is guaranteed to happen no more with this watch! It will actually alert you if you walk out of range of your phone (approximately 30 feet), so you’ll never have to worry about leaving your phone anywhere agian. Although the Martian Watch isn’t exactly like your everyday smartwatch, for a smartwatch under $50, we think it’s an amazing deal that also happens to be very stylish! It also comes in about 10 different colors which definitely makes it the smartwatch with the most color options for under $50. We almost forgot to mention the amazing battery life with this watch! You’re actually able to use it for up to six days, all day without it dying.Being able to go a full work week without having to worry about charging your smartwatch? We think that’s pretty spectacular. If you’re not into the “techy” look of traditional smartwatches and don’t need another giant screen in your life and just want something to quickly give you notifications right when you need them – we think we’ve found your watch. Plus there’s a color for everyone. We love the Martian Watch and we think you will too! 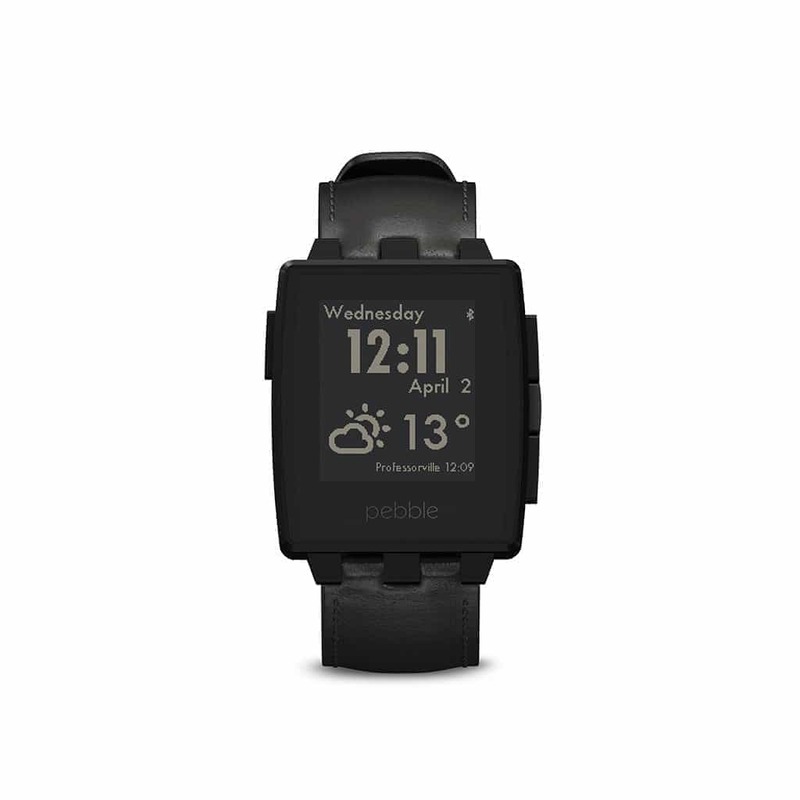 Up next to give the Martian Watch a run for its money is the Pebble Steel Smartwatch! Just like the Martian Watch, it definitely has its own unique look that makes it stand out in its space. Pebble also avoids the “techy” look of a smartwatch that sometimes turns a lot of people off from purchasing their first smartwatch. The Pebble Watch has an innovative look that’s the perfect combination of modern and classic. It touts its own app store where there are thousands of apps that you can choose from to customize your smartwatch to exactly the way you want it. While the screen might not be brightly colored and have a super high resolution, we don’t think you’ll be disappointed with the features that Pebble packs in. Firstly, of course, you can get all the push notifications that you could possibly want to be sent straight to the Pebble. Texts, calls, calendar events, and any other social apps you might want will go straight to your wrist and you’ll even be able to filter more specifically what types of notifications you want. It also will include a Pebble timeline that chronologically displays every notification in a list for you to easily look at at a glance. Also included is the ability to control your iTunes library, Spotify library, or even your Pandora playlists! All from your watch. So if you’re commuting, instead of having to pull out your phone every time to switch the song, you can easily change it from your wrist. It’s crafted with high-quality Gorilla glass so you know the face will be strong and able to withstand any sort of blow that might come to it. One huge benefit to the Pebble Steel Smartwatch is that it comes with its own app store, which is huge. That means there will be a much larger selection of apps for you to use to customize your watch. There are tons of different faces and layouts you can choose from as well as sports and fitness apps. We don’t think you’ll find this kind of app store that comes with any smartwatch that costs under $50. You would think that with all the features that the battery would die right away, right? You can actually go 5-7 days on a single charge! That’s an entire work week you could wear your watch without having to even think about putting it on the charge. We think that’s pretty impressive. Overall, the Pebble Smartwatch is definitely one of the “higher-end” feeling watches that you’ll be able to find for under $50. It doesn’t look the most modern but it actually includes a lot of the more modern features. Another added bonus is that there are a bunch of different bands that you’re able to switch out on the watch. This allows you to give it a little bit more of a modern feel to it. We really like the Pebble Steel Smartwatch and think it’s definitely going to be a top contender for the best smartwatch under $50. It’s almost impossible for you to be disappointed by it, so we’re giving a bright green light in terms of going for it. For as much as the previous watch was the antithesis of the typical looking smartwatch, this watch is the quintessential image that comes to mind when you think of the term smartwatch. It’s circular, has a sleek band, and features a bright display that automatically lets you know that it’s definitely an electronic watch. However in this case, we don’t think that’s a bad thing! It looks sleek like a smartwatch but also with its digital face but also incorporates the minute indicator around the face of the watch which is usually only seen on non smartwatches. The question that has to be asked now is, does the SEPVER SN05 live up to how beautiful it looks? Or is this a case of looks can be deceiving? Well it wouldn’t have made it onto our list if it wasn’t as great on the inside as it is on the outside. This smartwatch brings back one of the features we love from the first couple of watches – it’s able to run independently with a sim card in it. While you may not use this feature at first or even for a while, it gives you the added flexibility and versatility that you may want down the road. With the sim card, you can make and receive calls without having your phone anywhere near by. The screen has a very high resolution and looks very sharp and crystal clear. It also has a very highly sensitive touch capacity so you can be sure it will always recognize your touch every time you go to use it. Other fun functions it includes is: a pedometer, a sleep monitoring mechanism, a sedentary reminder to make sure you’re not sitting still for too long, image viewer, sound recorder, audio player, alarm, phone book, browser, calendar, and stop watch. Pretty much anything that you want your smartwatch to do, this will do it. Two other bonus features that the SEPVER SN05 includes that a lot of other smartwatches don’t have – a remote camera feature and also an anti-lost feature. The watch will actually start beeping when your phone gets out of range. Pretty great – no more leaving your phone at the bar on Friday night again. This watch is even waterproof! You won’t have to take it off when you shower or swim. This can be hugely beneficial, especially if you do a lot of your exercise in the water. While the watch actually looks a little bulky and tech-y, it is actually extremely lightweight and after just a couple of hours it’ll barely feel like you’re wearing a watch. This is a solid option for a smartwatch that offers a lot of features at such a low price point. It’s not even towards the top of the price range – it’s only $29. Smack dab in the middle. While it may not have the app store of the Pebble smartwatch, it definitely has a little bit more pizazz as far as design. Where this watch really excels is for sports/fitness tracking. It has a lot of great features for fitness tracking and also is very lightweight so you’ll barely notice it at all while you’re working out. If you like the tech-y look of smartwatches and really want to take advantage of all the fitness features that you can get from them, we highly recommend the SEPVER SN05. We think you’ll be pleasantly surprised for the price. The Luckiness Bluetooth Smartwatch is up next! This is also a watch that very much looks exactly like your typical smartwatch. 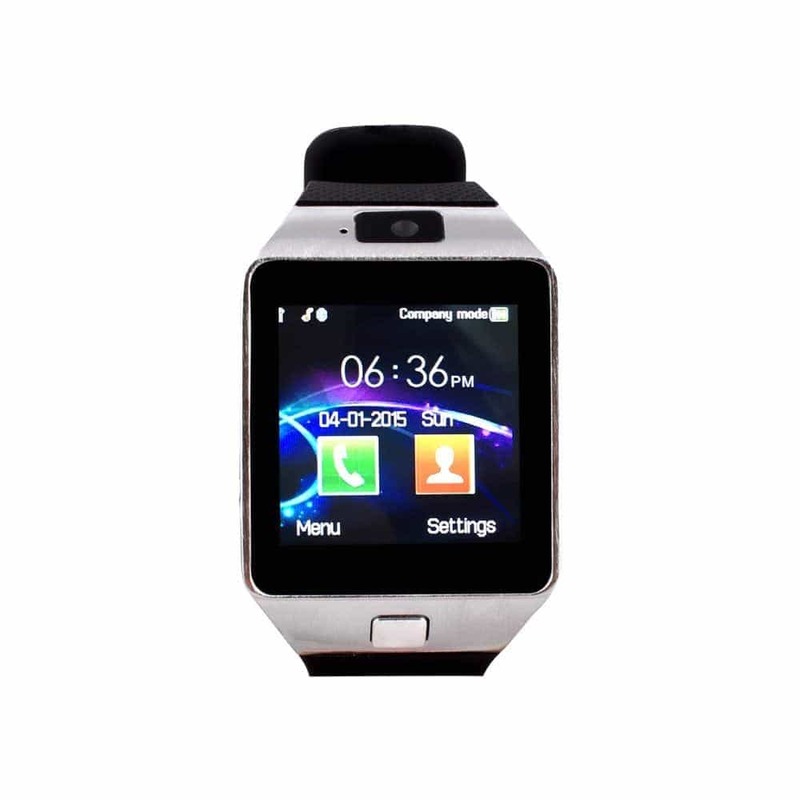 The screen is nice and bright and attractive and really stands out when it’s on your wrist. While it may look very technological, it still has a little bit of a classic look to it. This definitely may not be the fanciest smartwatch on the market, but it’s at a great price and still manages to include just about every feature that you would expect a smartwatch to include. Okay so let’s get into the nitty gritty and figure out exactly what this watch has to offer! Of course this watch includes one of our favorite features – the Luckiness Bluetooth Smartwatch can function independently as a phone of sorts without having to actually be connected to another phone. This does require an additional micro sim card but thankfully you can still make and receive calls without the sim card via Bluetooth mode if you don’t wan to get the extra sim card. The screen is attractive, florid, and looks very colorful. You’re actually able to see the screen very clearly even on the sunniest of the sunny days. There’s also a surprisingly powerful speaker built into the side of the watch. You wouldn’t think that on such a small device there’d be a speaker that allows you to hear so well but this smartwatch manages to include a pretty decent one. You’ll also be ready to go essentially straight out of the box – it’s super easy to pair the watch with your phone and you can be done setting it up in under five minutes. While this may not include an entire app store like the Pebble, you’ll still have access to five pages of apps pre-installed on the phone. These essentially provide you with just about anything that you could need from a smartwatch though. It has an alarm, pedometer, and a sedentary reminder just to name a few. One of the downfalls with this watch is the battery life however. The battery will only last about two days on a single charge. This still isn’t the end of the world though. 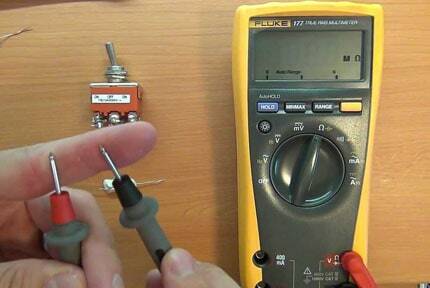 If you forget to charge your watch one night, then you’ll still be good to go in the morning. The Luckiness Bluetooth Smartwatch is also super comfortable to wear. The strap is adjustable and it doesn’t feel bulky on your wrist whatsoever. Overall, 26 bucks for this watch is a pretty good price. It has just about any feature you could want, is lightweight, and has a bright crisp display that not only looks great, but is also very easy to read. While the battery life does suffer a little bit, it’s still enough to get the job done. We should also note that this smartwatch doesn’t include remote camera access which is also kind of a bummer. 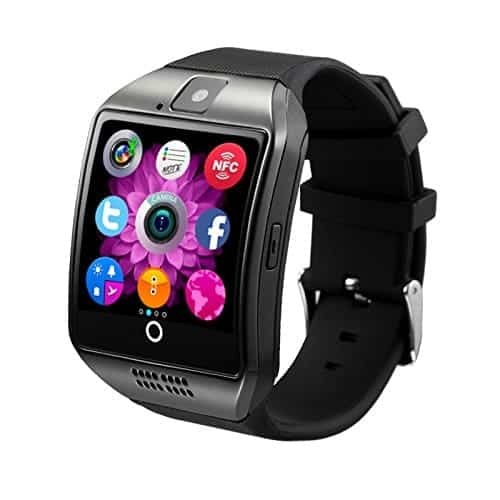 If you’re not looking for many frills however and just want to pay the lowest amount that you can for a decently functioning watch that also looks decent on you, then you’ll be very happy purchasing the Luckiness Bluetooth Smartwatch. The last watch we have on our list is the POSIUAN MSRM – another great budget option for only a little over $30 that not only looks sharp and like it costs more than it was, it works really well and has a highly sensitive touch screen. We want to make sure we note that it is compatible with both Android and Apple but the features are extremely limited if you do try and use it with an iPhone. You’ll be able to use the basic features such as making and receiving calls but you won’t be able to sync any of your calendar events or contacts. So just make sure to keep that in mind if you intend to use it for more than just call notifications. Okay – with that out of the way, let’s get into the meat of the review and see how our last watch, the POSIUAN MSRM stacks up against the previous five. As we mentioned, the touch screen is highly sensitive and works perfectly. The touch screen is easily almost as good as a touch screen you would find on any higher end watch. It can function independently as a phone if you insert a micro sim card but of course, also works in Bluetooth mode paired with any phone you might have. Speaking of, this watch is also particularly simple to set up and pair with your phone. The connection is strong and once it’s connected, you don’t have to worry about it becoming disconnected. It comes with a fitness tracker, sleep monitor, step counter, calories counter, sedentary reminder and also the basics like an alarm clock, calendar, and calculator – aka this watch is fully loaded. We really like the POSIUAN and think it’s a great option, especially for the price. It definitely has one of the best and most responsive touch screens that we’ve seen on a smartwatch under $50. If you’re after a cheaper smartwatch that looks and feels like a higher end model and doesn’t skimp on features, you won’t be disappointed with the POSIUAN MSRM. When purchasing a smartwatch, it usually really comes down to personal taste a lot of the time. With that being said however, there are still a few key features that you should be on the lookout for and if you don’t know them, you could end up making a tragic mistake and choosing the wrong smartwatch and getting something you didn’t really want! Let’s go over a few of those features to make sure you don’t accidentally miss anything when you go to buy your first watch. The absolute first thing that you need to be on the lookout for is compatibility! You don’t want to purchase what you think is the perfect smartwatch only to get it in the mail and realize your phone isn’t even compatible. Just about every watch will technically work on both Android and iPhone platforms but could possibly be limited in their features. 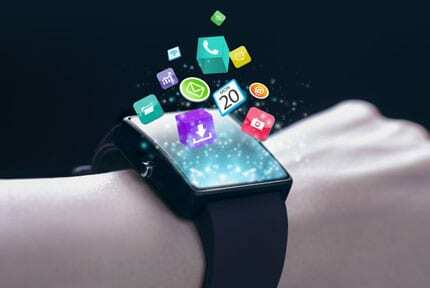 Also make sure that you have the latest software version on your phone as the smartwatch may require you to be up to date to work to its fullest capacity. What kind of style of smartwatch are you looking for? Do you want a smartwatch that looks like you’re wearing a tiny phone or would you prefer one that looks a little bit more like your traditional watch? Both kinds do exist – even for under $50! So keep looking until you find a style that suits you. You’ll want to double check exactly what apps your smartwatch comes with. Are you looking to use this watch mainly to track your movement and exercises? Or do you want to primarily use it to make sure you receive important notifications? Whatever the reason is, make sure that the smartwatch you’re buying does exactly what you need it to. Battery life can vary wildly from watch to watch. Some will easily last a week while some will only last you a day or two before needing to be recharged. If you don’t mind throwing it on the charger every night then you should be good to go. But if you’re someone who has trouble making sure your devices are fully charged, see if you can find one that lasts a few days. Owning a smartwatch is not just for people who want to drop $300. You can buy a stylish, functional smartwatch for under 50 dollars easily. Not only can you buy one for under $50, but you have plenty of options to choose from as well. While there are six great smartwatches on this list, one really stood out as the best smartwatch under $50. Which one is it you ask? We won’t keep you in suspense any longer! 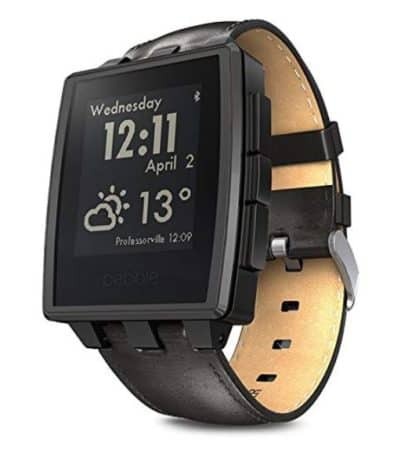 The best smartwatch that you can buy for under 50 USD is the Pebble Steel Smartwatch! We simply can’t believe how many features this watch comes with for under $50 which is honestly impressive. It is waterproof up to 165 feet, can last 5-7 days on a single charge, has its own app store, and you can even customize the bands on it! It also looks pretty snazzy as well. The Pebble Steel Smartwatch is the perfect way to stay connected while also improving your look and fitness tracking. It’s crafted with high-quality gorilla glass as well so you don’t have to worry about accidentally smashing it on anything. Overall – we know you’ll be happy with this purchase.